•The 2013 BMW X1 will be priced from $31,545, including shipping, when it begins reaching U.S. dealers this fall, nearly three years after its European launch. •The U.S. edition of the X1 compact crossover will be offered initially in three versions — the X1 sDrive28i, the X1 xDrive28i ($33,245) and the X1 xDrive35i ($39,345). •Assembled in Leipzig, Germany, the X1 will be BMW's smallest crossover in a lineup that now includes the X3, the X5 and the X6 and soon will add the X4. WOODCLIFF LAKE, New Jersey — The 2013 BMW X1 will be priced from $31,545, including shipping, when it begins reaching U.S. dealers this fall, nearly three years after its European launch. To be unveiled this week at the 2012 New York Auto Show, the U.S. edition of the X1 compact crossover will be offered initially in three versions — the X1 sDrive28i, the X1 xDrive28i ($33,245) and the X1 xDrive35i ($39,345). All prices include an $895 shipping charge. The rear-wheel-drive X1 sDrive28i and all-wheel-drive X1 xDrive28i share a 240-horsepower twin-turbocharged 2.0-liter inline-4engine, while the range-topping X1 xDrive35i features a 300-hp twin-turbo 3.0-liter inline-6. All engines get auto stop-start and automatic transmission. Introduced at the 2009 Frankfurt Auto Show, the X1 went on sale across Europe in 2010 and originally was scheduled to reach U.S. dealers in late 2010. But the German automaker, citing strong European sales and a weak dollar-euro exchange rate, last year put the U.S. launch of the X1 on indefinite hold, electing eventually to bring the vehicle here as part of a midcycle freshening for 2013. Assembled in Leipzig, Germany, the X1 will be BMW's smallest crossover in a lineup that now includes the X3, the X5 and the X6 and will be expanded further in 2014 with the addition of the sporty X4. For model year 2013, the X1 gets a mild exterior makeover (compared with the current European model), with new headlamps and a revised rear fascia among the more visible changes. In the cabin, the subtle eyelift includes a bit more chrome and some gloss black trim. The BMW X1: The U.S. Now Gets its First Sub-Compact Premium SAV. 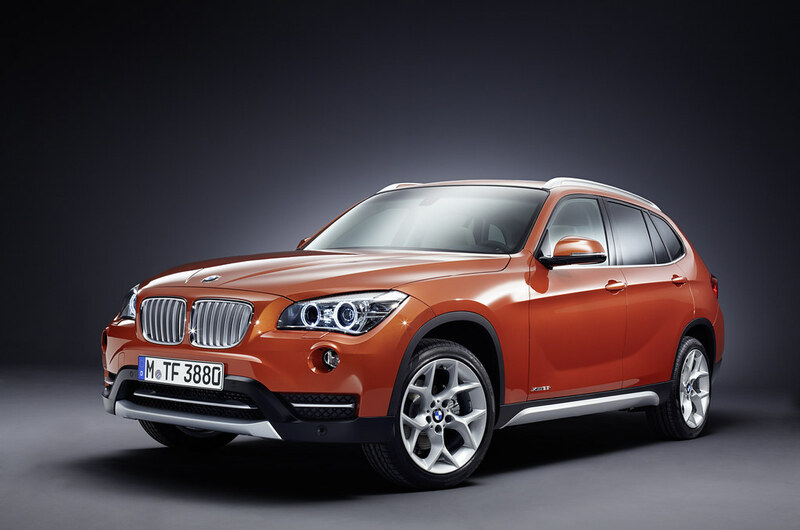 The Globally Successful BMW X1 comes to the US in the Fall 2012. Design: new touches to sharpen its contemporary looks and enhance its versatility and sporting flair. Typical BMW proportions, expressive, vibrant surfaces and signature BMW X model design cues shape the appearance of the BMW X1. A sweeping hood, long wheelbase and set-back passenger compartment emphasize the vehicle’s dynamic talent, while attractive light and shade effects hint at its inherent agility. The versatility and robustness of a BMW X model are reflected in elements such as the black edging at the lower edge of the body and wide wheel arches. When viewed from the front, the powerful stance of the new BMW X1 on the road and its aura of quality are now accentuated with even greater intensity. A larger number of surfaces painted in body color highlight the vehicle’s enhanced elegance. The path of the vehicle’s lines, which converge on the license plate mount from either side of the BMW kidney and forge outwards in the lower section of the bumper, is borrowed from BMW X models in higher vehicle segments. The newly designed headlights allow a detailed view of the advanced light technology within. And a chrome-coated accent strip now cuts across the top of the twin circular headlights. Meanwhile, an LED accent light – included as part of the optional xenon light package, complete with LED light rings for the daytime driving lights – provides the classic BMW focused look. The distinctive profile of the X1 is defined by a main character line that rises steadily to the rear of the vehicle while another line visually extends the contours of the side window surrounds as it flows towards the rear. The pronounced side skirts – that are a signature feature of BMW X models and the powerfully bulging wheel arches add sporting flair. Finally, the turn signal indicators are now integrated into the newly designed exterior mirrors. The premium feel of the new BMW X1 is also underlined at the rear by the new subdivision of fascia, bumper and undertray, with the repositioned reflectors now also bordered by surfaces painted in body color. As a result, the black elements are slimmer, while the silver-colored undertray has a more striking surface structure. Interior: precise lines, high-quality materials, sophisticated color scheme. 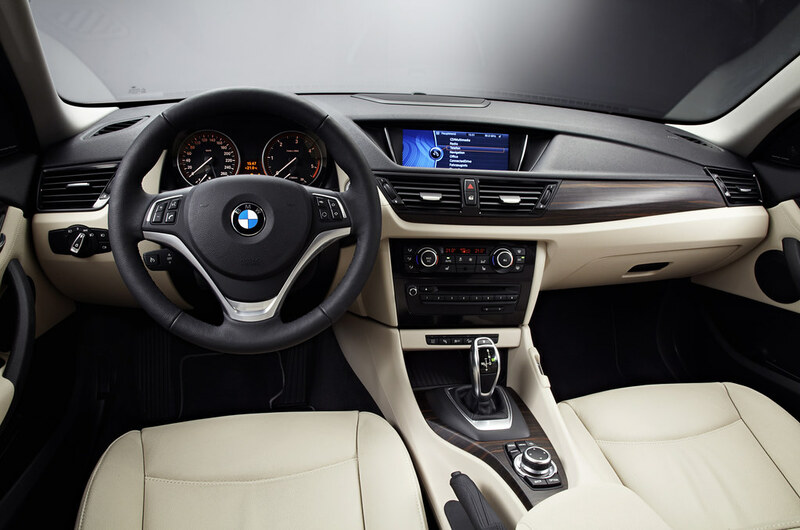 The modifications to the design of the new BMW X1 interior create an even more vivid showcase of the sporty driving pleasure, cutting-edge versatility and premium feel this vehicle provides. The side of the center console angled towards the driver is now shallower, spotlighting the driver-focused nature of the cockpit design. High-quality electroplated trim surrounding for the gearshift lever and center console cupholders, a chrome strip for the headlight switch and chrome touches for the side edging of the Control Display – when the optional navigation system is specified – all add the finishing touches to the interior’s premium feel. Plus, the air vent surrounds are given a high-gloss black surface. The BMW X1: more sporting and efficient than ever. 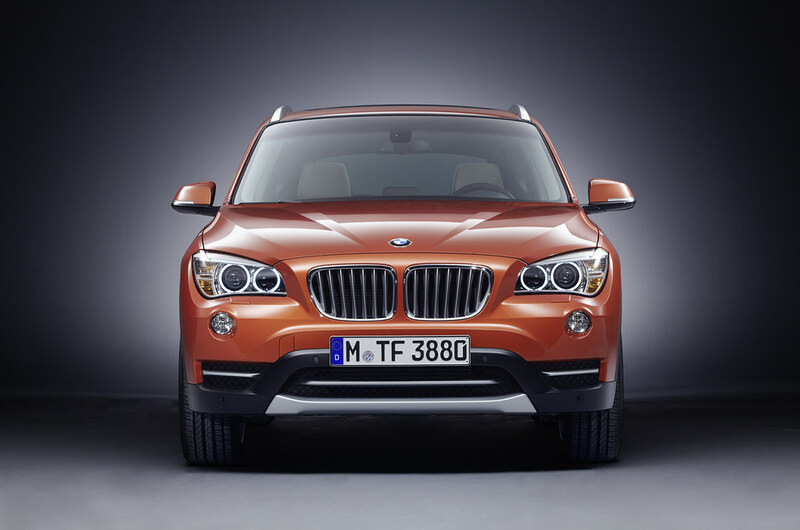 The variants of the BMW X1 offered in the US market will be powered by BMW TwinPower Turbo gas engines. This package of technology consists of twin-scroll turbocharging, High Precision Direct Petrol Injection, VALVETRONIC variable valve timing and Double-Vanos variable camshaft control. In both the award-winning 6-cylinder inline engine under the hood of the BMW X1 xDrive35i – developing 300 hp – and the 240 hp 4-cylinder engine powering the BMW X1 sDrive28i and BMW X1 xDrive28i ensure instantaneous power delivery, impressive acceleration and exceptional efficiency. Both engines are paired with an automatic gearbox and extensive BMW EfficientDynamics technology. Features including the Auto Start-Stop function (28i only), Brake Energy Regeneration and demand-based operation of ancillary units all help to achieve a blend of performance and fuel economy unique in the market. The BMW X1 sDrive28i with customary BMW rear-wheel drive and the all-wheel-drive xDrive35i will be offered exclusively in the US market. The intelligent all-wheel drive of the BMW X1 xDrive35i and BMW X1 xDrive28i varies the distribution of drive between the front and rear wheels, as required. This electronically controlled power distribution ensures optimum traction and unbeatable directional stability in all weather and road conditions, as well as noticeably sportier responses through dynamically taken corners. The BMW X1 sDrive28i, the X1 xDrive28i and the X1 xDrive35i will retail for $31,545, $33,245 and $39,345 respectively (including $895 Destination and Handling). Our CDN dollar is just above par today. So, our X1 xdrive28i that sells for $38,500 CDN MSRP costs $38,600 US before taxes. Without any of the Apps, Lighting, Premium, Sport, Convenience, or Nav packages. Then add shipping. I haven't considered the difference in the included maintenance plans (we don't get full maintenance). Our duty rate is around 6%, while the US charges 2.5%. Considering the advertised price of $33,245 US including shipping, there is a 12% discrepancy there. Buy one while it lasts. I'm happy that BMW is offering a rear-wheel drive variant for the US. Unfortunately, the lack of a diesel and manual transmission take it out of contention. Fuel consumption is a deal-breaker for me thesedays. But it's a great little crossover (I've seen it in person in Germany and Canada) and I'm sure there will be many E83 enthusiasts who will be interested. Me too, on the RWD...wish they were offering the 6 spd. I realize it probably requires an additional EPA cert, but jeeshh... a diesel would be nice, too, for range more than mpg, as the arith comes out pretty closely, vis a vis diesel fuel cost vs gas cost/mpg, unless a diesel has really high mpg. But, it is what it is. Saw many X1s in CDA this past summer, and they look better in person, from some angles. The xDrive28i consumes 10,4 l/100km (22,6 US mpg) in the urban cycle and 7,9 l/100km (29,8 US mpg) combined. Compare that to the xDrive23d: 7,8 l/100km and 6,3 l/100km (30,1 US mpg and 37,3 respectively). Both figures are for the automatic trans, 8-speed and 6-speeds respectively. There is no sDrive28i for Europe. Theoretically with the diesel, you could get +/- 1000km (or about 600 miles) to one tank. That's stellar and ideal for folks like me who do a fair amount of highway driving in the (sort of big) state of North Carolina. My X3 is fine for what it is but filling up every 375miles (tops) or so is real annoying!